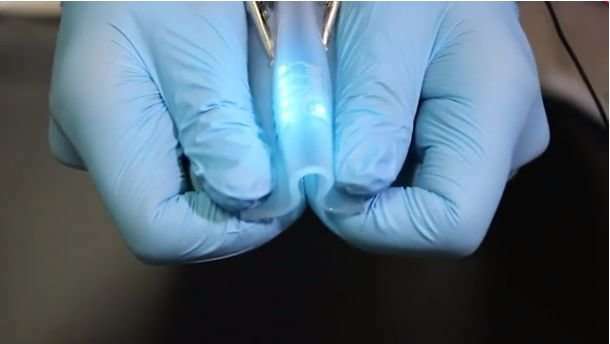 Researchers in China have made a new hybrid conductive material—part elastic polymer, part liquid metal—that can be bent and stretched at will. Circuits made with this material can take most two-dimensional shapes and are also non-toxic. The work appears June 14 in the new interdisciplinary journal iScience. 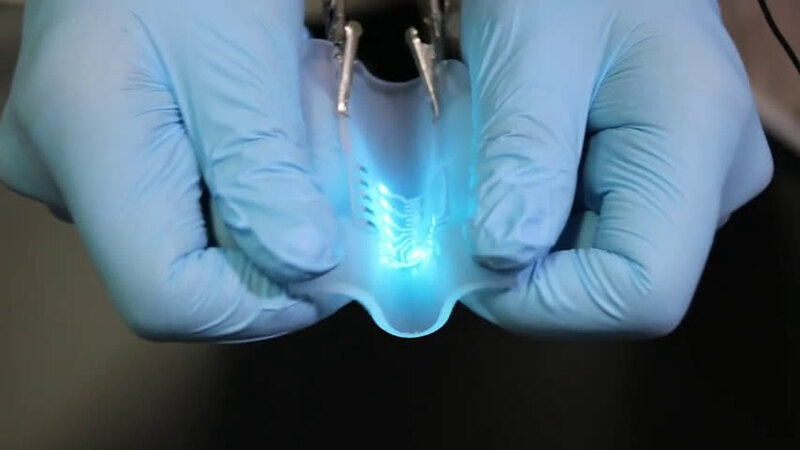 "These are the first flexible electronics that are at once highly conductive and stretchable, fully biocompatible, and able to be fabricated conveniently across size scales with micro-feature precision," says senior author Xingyu Jiang, a professor at the National Center for Nanoscience and Technology. "We believe that they will have broad applications for both wearable electronics and implantable devices." The material that the researchers fashioned is called a metal-polymer conductor (MPC), so called because it is a combination of two components with very different yet equally desirable properties. The metals in this case are not familiar conductive solids, such as copper, silver, or gold, but rather gallium and indium, which exist as thick, syrupy liquids that still permit electricity to flow. The researchers found that embedding globs of this liquid metal mixture within a supporting network of silicone-based polymer yielded mechanically resilient materials with enough conductivity to support functioning circuits. In this video, the LED circuits interconnected by MPC can undergo repeated bending, twisting, and stretching. Credit: Tang et al. Up close, the structure of the MPC can be likened to round liquid metal islands floating in a sea of polymer, with a liquid metal mantle underneath to ensure full conductivity. The researchers successfully tried out different MPC formulations in a variety of applications, including in sensors for wearable keyboard gloves and as electrodes for stimulating the passage of DNA through the membranes of live cells. "The applications of the MPC depend on the polymers," says first author Lixue Tang, a graduate student in Jiang's research group. "We cast super-elastic polymers to make MPCs for stretchable circuits. We use biocompatible and biodegradable polymers when we want MPCs for implantable devices. In the future, we could even build soft robots by combining electroactive polymers." In principle, the authors state that their method for manufacturing MPCs, which involves screen printing and microfluidic patterning, can accommodate any two-dimensional geometry, as well as different thicknesses and electrical properties, depending on the concentrations of the liquid metal inks to be sprayed. This versatility could lead directly to desirable biomedical applications, such as flexible patches for identifying and mitigating heart disease. "We wanted to develop biocompatible materials that could be used to build wearable or implantable devices for diagnosing and treating disease without compromising quality of life, and we believe that this is a first step toward changing the way that cardiovascular diseases and other afflictions are managed," says Jiang. Why doesn't the atom absorb heat energy when it is low? Is mass same as matter?